A recent Center for Disease Control (CDC) survey found that 25.6 percent of all US households had only a wireless telephone in the last half of 2009, up from 8.6 at the beginning of 2006. The percentage of US households with a mobile phone was 82.7 in the second half of 2009, up from 56.1 in the second half of 2006. 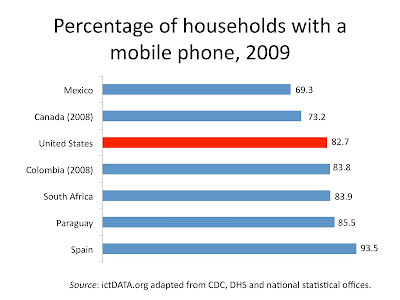 The share of US households with a mobile phone is higher than Canada or Mexico. However a number of countries in the Western Hemisphere have a higher penetration than the US including Colombia and Paraguay. 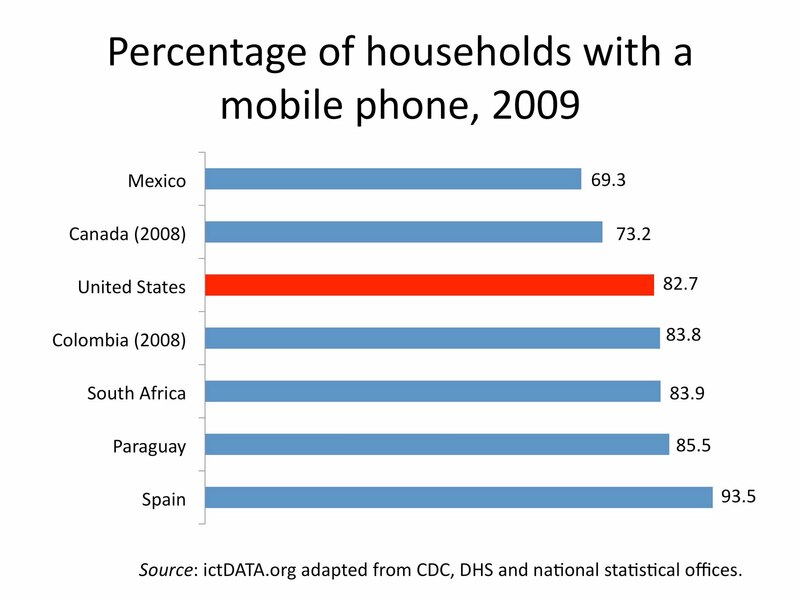 In South Africa, site of the 2010 football World Cup, there are slightly more homes with a mobile phone than the US. "The potential for bias due to undercoverage remains a real and growing threat to surveys conducted only on landline telephones...for health-related behaviors, health care service use indicators, and health care access measures, caution is warranted when using landline surveys to draw inferences about subpopulations more likely to be wireless-only (such as young or low-income adults)." While the CDC carries out surveys on US home telephone ownership, Measure DHS carries out demographic and health surveys on a global basis in many developing nations. As part of the section on household characteristics, there is data on the percentage of homes with a mobile phones.